What is the best way to make your own baby food ? 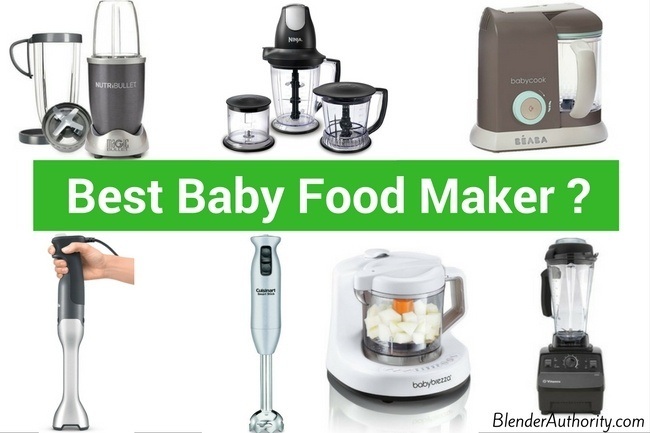 It can be confusing comparing the best baby food makers, processors, and baby food blenders. If you are reading this article then I assume you already understand the health benefits of making homemade baby food. It really isn’t that hard to make your own baby food because you are just pureeing normal foods. The trick is how to to make baby food quickly without a lot of hassle. In this article I will explain how the different baby food makers work and what is the best type of product for your needs. Personally, I like baby food blenders, which I will explain later on. The big question is do you want a baby food maker or a baby food blender ? Let me explain. Baby food makers were originally just small-scale food processors that diced and blended cooked ingredients. This meant you first had to steam and cook the foods before using the food processor. The newer models include steaming functionality so that it can cook and blend as an all in one solution. While these new versions provide all-in-one simplicity, they can be expensive and there are some downsides to them. The main downside of all-in-one baby food makers is they only make small portions and are limited in use once your baby grows out of just eating pureed foods. The other downside is they can be difficult to clean which can cause potential hazards like mold. BEABA Baby Cook Steamer and Blender – The most popular model but more expensive. Cuisinart BFM-1000 – Nice features for the price. Baby Brezza One Step Baby Food Maker – Has mixed reviews about reliability. If you really like the idea of an all-in-one solution then a baby food steamer/processor might be worth considering. Especially when you consider the better nutrition of homemade baby food and the savings from not buying commercial baby food. Personally, I don’t like all-in-one baby food makers and prefer using a blender for baby food which I will explain below. Some blender brands that have come out with models specifically for baby food, such as the Nutribullet Baby Bullet and Nuk Baby Food Maker. These baby food blenders are usually under powered, mini blenders with accessories for storing small portions. They are limited to only blending soft and pre-cooked ingredients. My suggestion for making baby food is to either use an immersion (hand-held) blender or a high speed blender. Immersion blenders (aka “handheld blenders”) are versatile, EASY TO CLEAN, reasonably priced, and can be used for a long time. The biggest advantage of using an immersion blender to puree baby food is that it is portable and can blend ingredients in whatever pot or bowl you have the food in. Also, it doesn’t take up counter space and doesn’t have a lot of parts/accessories to clean. High speed blenders can be used for many, many years and can puree just about anything as well as do other tasks like soup making, nut butters, food prep, and more. The advantage of high-speed blenders is that they offer more versatility than immersion blenders or baby food makers. Immersion blender vs. High Speed Blender ? The main downside of a immersion blender is they are not intended for heavy blending tasks. A high speed blender will handle a wider variety of tasks if you want to make more than just soft baby foods. Also, a high speed blender can even puree certain raw vegetables without them needing to be cooked prior. Now that you understand why I recommend using a blender for making baby food, lets get into my favorite blender models. I divided the blender choices into Immersion(hand-held) blenders and regular blenders. The Breville BSB510XL Control Grip Immersion Blender is a powerful immersion blender with 280 watts of power . It ranks highly in independent blender tests and has very high consumer ratings. It rates well in its ability to make very smooth purees and its ease of use. Also, it comes with a large 42 ounce blending jar, variable speed controls, and a beautiful design. Overall Opinion : The Breville Control Grip is not the cheapest model, but it works extremely well, will last a long time, and is easy to use. A great choice if you will be using it a lot and want the ability to use it in the kitchen for other uses. If you don’t have the money for the Breville model above, then consider the economically priced Cuisinart Smart Stick CSB-75BC blender. It is a 2-speed hand blender with 200 watts of blending power which is plenty of power for making soft baby foods. It doesn’t come with any other attachments so it is strictly for pureeing baby food, soups, smoothies,and sauces. It doesn’t blend exactly to the consistency of the Breville immersion blender and feels a little “cheaper”, but it performs well in blender comparison tests and continues to be a top seller with over 5000 consumer reviews. Overall Opinion : The Cuisinart Smart Stick is a useful, low-priced blender and works well blending cooked, soft ingredients. It will blend as well as some more expensive immersion blenders but might not last as long as the Breville. The Ninja Master Prep is very affordable, portable blender that is a mix between a blender and a food processor. It has a 450 watts motor which is almost 100% more power than a typical immersion blender. The Ninja master Prep works like an immersion blender in that the blade is on the top. It comes with multiple food prep containers (48oz blending pitcher / 40oz food prep bowl / 16oz chopper bowl). It was top rated by Consumer Reports as a Best Buy and has an excellent score for its ability to puree foods and crush ice. Besides making baby food, the Ninja Master Prep can crush ice, make smoothies, and perform a wide range of food prep activities(mince/dice/chop). Overall Opinion : The Ninja Master Prep is a great choice for making baby food with plenty of power and is more portable than a full size blender. It provides much more versatility than a typical baby food maker so that you can use it for a long time. I realize the Vitamix 5200 is more expensive than all the other products mentioned in this post but the reason is because it does so much more and will last for decades. The Vitamix is used by many professional chefs and consistently ranks at the top of almost every independent blending test. Consumer Reports ranks the Vitamix 5200 at the top of its puree blending and durability tests. If you have the budget then a Vitamix blender is worth considing. Here is a sample Vitamix baby food recipe. It blends so fast that it can turn cold ingredients into hot soups. It also can make bread dough, nut butter, flour, food prep, dips, and more. Overall Opinion : The Vitamix 5200 can puree anything including raw, uncooked vegetables. If you just want to make simple baby food then the Vitamix might be more than what you need. Many moms that get into making their own baby food realize how much they enjoy making their own healthy foods that they upgrade to a high speed blender like a Vitamix because it can make a wide range of foods and drinks. There are a lot of Vitamix blender models but the 5200 is the “classic” and can handle smaller recipes compared to some of the newer Vitamix “low-profile” models. 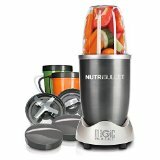 The Nutribullet 600 is a personal size blender that works great for making baby food and is a good option if you don’t want a full size blender. (It works much better than the Magic Bullet blender or the Baby Bullet blender). The Nutribullet 600 has plenty of power with 600 watts and is more versatile than appliances targeted only to making baby food. It can puree fruits, vegetables, nuts, seeds, and more. It comes with different size jars and an additional milling blade. The milling blade is great for making your own flour( from nuts, seeds, and oats), grinding spices, and food prep. Overall Opinion: The Nutribullet 600 is a great choice if you want a portable, mini-blender for baby food that is easy to use and clean. I’ve used this model many times and it works great. It is portable, powerful and has nice accessories. It is excellent for making personal-size smoothies. The only negative to using the Nutribullet for baby food is the company says not to use hot liquids/hot food in the blender so you want to make sure your steamed vegetables are not hot before blending. Making your own baby food is really quite easy and any of the products mentioned in this guide will do fine for any budget. The most important deciding factor is how much you really want to pay for an appliance that you might not use very long and is limited in its capabilities, which is the problem with baby food makers. This is why I prefer getting a blender for making baby food because they are versatile and you won’t outgrow them. IF you have questions or feedback then please leave in the comments below. Very Helpful Article. I am looking for a baby food blender which is high speed and durable. and I think “NUTRIBULET 600” would be a great choice. Thanks for helping me to find out the perfect baby food blender. Hi Shenaz, thanks for the feedback. Yess the Nutribullet 600 is a great baby food blender and plenty of power for other blending tasks.